Seems our understanding of how p-B11 works MAY have been wrong - potentially to our benefit. Flat out wrong. This is what a team of Duke University researchers has discovered, much to its surprise, about a long-accepted explanation of how nuclei collide to produce charged particles for electricity — a process receiving intense interest lately from scientists, entrepreneurs, and policy makers in the wake of Japan’s nuclear crisis. Plasma physicists have been trying for twenty-five years to create electricity from the fusion of boron and hydrogen atoms. The new study says their efforts have been based on a misunderstanding of the underlying physics – although the error could end up actually helping those looking to fusion energy as an alternative energy source. Researchers have been developing reactors to slam hydrogen at high speeds into boron-11, a collision that yields high-energy helium nuclei, or alpha particles. Those alphas then spiral through a tunnel of electromagnetic coils, transforming them into a flow of electrons, or electricity. “Obviously, a detailed understanding of the energy and location of every outgoing alpha particle is crucial to the development of this reactor,” says Duke nuclear physicist Henry Weller, a co-author of the new study. As much as I hope for some success in the fusion arena in reality there are no promising fusion systems for propulsion yet. There is no guarantee that any of the approaches is workable or practical. I have little hope for tokamaks anymore. We are going to have to get lucky with something like Polywell or FRC. Contained fusion with energy gain is just an incredibly difficult thing to accomplish. Hopefully not too much time. Yeah instead of one high energy alpha and two low energy alphas, you get two high energy alphas and one low energy alpha, which means that thermalization losses will be lower and electric output will be higher, so it will be significantly easier to achieve commercial viability with this sort of fusion than previously thought. So far the highest gains in fusion energy have been made using tokamaks and they seem to be the preferred concept for the evolution into an electric power station. I don't see why we should not pursue research in that direction, when scientists working on ITER, JET or other tokamaks seem to be hopeful. ITER is supposed to give off several times more power than it consumes to initiate the fusion reaction. D-T is not the best fuel, that's right, but it is the least difficult to fuse, which means it will probably be the fuel used in first generation fusion power reactors. D-T is easiest, followed by D-D, D-He3, p-B11 and He3-He3, with the He3-He3 being the only reaction which is completely aneutronic. If ITER is succesful, we may see the first D-T fusion powerplant by 2050 and perhaps second generation plants burning D-He3 by 2100 (temperatures high enough to fuse D-He3 have been achieved in tokamaks). So isn't it likely we'll see p-B11 fusion before D-He3. D-He3 also seems to be the preferred fuel for fusion spacecraft, if you look at most fusion propulsion studies. 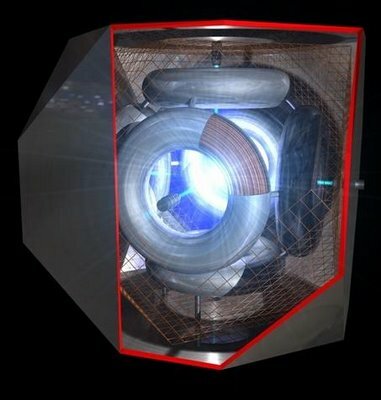 A form of fusion propulsion which may be viable even if it is impossible to produce net electricity from a fusion reaction may be antproton initiated inertial confinement fusion, where beams of antiprotons ignite pellets of fusion fuel coated with heavy atoms like Uranium. In an antiproton ICF drive you only need electrical power to store the antiprotons and drive the antiproton accelerators, which can be done using a small nuclear fission reactor. The energy of the fusion reaction would be used solely to produce thrust, there would be no need for heavy power conversion equipment or radiators. The thrust to weight ratio would probably be quite high. So one can imagine a future where fusion rockets blast through the solar system, yet most power on Earth is provided by solar, wind, water and nuclear fission. I don't know about Bussard, but my understanding is that the "magnetic bottle" concept has not yet been made to work. This was the problem at the World's Fair in 1964, and continues to be the problem today. I anybody working on containing the plasma in a magnetic bottle? A polywell is essentially a magnetic bottle, but one that encourages ions to pass in and out of the center a lot so that each ion has many chances to fuse. Think of it like each ion orbits within the magnetic well in highly eccentric orbits, so they all cross each others orbits a lot in the center and thus have a lot of chances to collide with each other at just the right energy to fuse. IMHO, tandem mirror fusion is the most promising. The design allows it to convert it to an engine very easily. Quite a lot of research has been done. The new version, officially MFTF-B, started construction in 1977 and was completed in 1986, on the very day the project was canceled by the Reagan administration Department of Energy. No experiments were performed. There are a number of unsolved problems with D-T fusion. Number one is probably the First Wall problem. There is no known material to make the inside wall of the tokamak from that can withstand the 17 Mev neutron flux for very long. I believe ITER is only projected to run for a total of 1000 seconds. Another large problem is Tritium breeding. You need 1 tritium atom for every D-T fusion. This releases 1 neutron. If this 1 neutron is absorbed by a lithium atom it creates a tritium atom. However there are losses. Neutrons absorbed in the wall and other structures. Tritium losses, tritium decay, etc. There are schemes to do neutron amplification by impacting the neutrons first into lead etc. but it's not certain at all yet that in a working tokamak that you can breed as much tritium as you use. And of course there is cost. The energy density in a tokamak is something like 1/20 of what it is in a nuclear reactor. The whole machine has to be BIG to produce a substantial amount of power. The expense is enormous, orders of magnitude more than a nuclear reactor. The vast majority of the cost of nuclear power is the cost of the plant. The cost of fusion power will be extremely expensive. There is no guarantee that a viable tokamak fusion power generator will be achieved. Even if it is all indications are that it will be so expensive that it will never be an economically viable source of power. Fusion with anything other than D-T is much more difficult to accomplish. No, he's technically correct. Even if Polywell works, D-T (and to a lesser extent D-D) will have much lower voltage and B-field requirements and/or a much higher power density than p-¹¹B - if the latter is even possible. Yeah thats what I meant. The losses of operating a liquidl cooling power cycle for a D-T fusion reactor, esp a tokamak, require the tokamak produce a LOT more power to achieve net power production than polywell requires. That, and the mass issue means tokamak is useless for space propulsion, which is the topic of this thread.